Heat oven to 350°F. Spray 13x9-inch (3-quart) baking dish with cooking spray. Place bread cubes in baking dish. In 10-inch skillet, cook sausage, celery and onion 5 to 7 minutes over medium-high heat, stirring occasionally, until sausage is no longer pink and vegetables are tender. 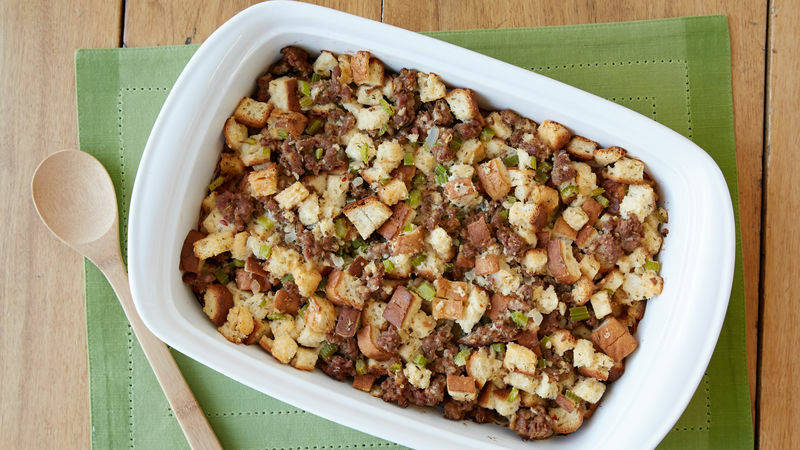 Gently toss sausage mixture and thyme into bread cubes until well blended. In medium bowl, beat chicken broth and eggs with fork or whisk until well mixed. Pour broth mixture over bread cubes; stir until most of broth mixture is absorbed. Cover with foil. Bake 30 to 35 minutes or until center is hot. Uncover; bake about 15 minutes longer or until top is light golden brown and crisp. Substitute gluten-free Italian sausage or gluten-free Italian turkey sausage for the hot pork sausage in this recipe.